Gaurav Gill has won the Rally of New Caledonia for a third time as Team MRF and Race Torque locked out the top three positions in second round of the Asia-Pacific Rally Championship (APRC). 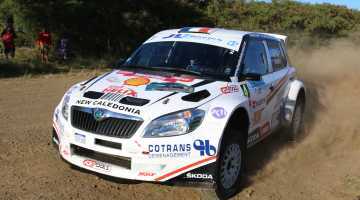 Driving a Skoda Fabia Super 2000, the Indian and his Australian co-driver, Glenn Macneall, took the lead during the first day and were never headed as they led home team-mates Pontus Tidemand (Sweden) and Jean-Louis Leyraud (France) in identical cars. Gill’s win, his third in four years in New Caledonia, now sees him just three points behind Tidemand in the battle for the championship lead, with both drivers having won and event apiece. “It’s been a great weekend for us and the team. We had some small issues at the start of the weekend, but the team made a good effort and got it sorted which helped us get the confidence back in the car,” Gill said. Gill’s lead was cut from two minutes to just 39 seconds on the final day as Tidemand charged through the final day’s stages to try and cause an unlikely win. The former Swedish Champion was delayed with a flat tyre on the first day after he slid into a wall, and had to stop and change it. “We had more good experience on this rally. It is a different surface and for sure, we had a puncture in the first stage that was my mistake,” Tidemand said. 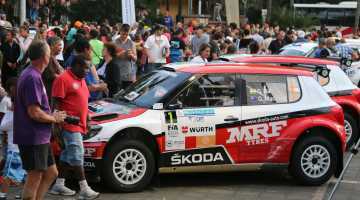 The third Race Torque Skoda Fabia S2000 of Jean-Louis Leyraud and Australian Scott Beckwith finished the event in third place after another solid drive. “We finished on the podium as I wanted. It is very good and I am leading the New Caledonia Championship and I’m the first New Caledonian driver,” Leyraud said. Team boss, Lane Heenan, was thrilled with the team’s performance over the weekend, having now achieved two 1-2 finishes in successive events. “After New Zealand we knew that Pontus was going to be very fast in New Caledonia, despite this being his first time here,” Heenan said. Straight after the Rally of New Caledonia, Tidemand and co-driver, Emil Axelsson, left to contest the Rally of Portugal, where they will debut Skoda’s new R5 rally car in the World Championship event.